Student understanding is the the tip of the iceberg. How is group interaction addressed in the classroom? 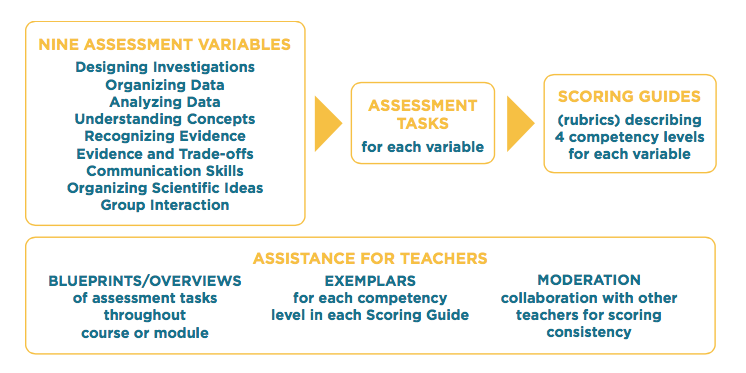 How do students get feedback on procedure design or the organization of their data? In our middle school and high school SEPUP-developed programs, student progress is measured through assessments embedded in the students’ regular work - beyond just the content. With provided scoring guides and exemplars teachers can easily set the criteria and better evaluate performance. This is an example assessing the variable Evidence and Trade-Offs. You find out that NIH has only enough money to fund one study and plans to fund the best one. Explain which study you would fund. Support your answer with evidence and identify the trade-offs of your decision. Hint: To write a complete answer, first state your opinion. Provide two or more pieces of evidence that support your opinion. Then consider all sides of the issue and identify the trade-offs of your decision. I think that the clinical trial of the summer fever medicine should be funded if it is rewritten. It should have a control group and look for side effects. Study 2 has a better design, with a control group and a large sample size. But the burns aren’t as serious as summer fever. The medicine for summer fever is the most important of the studies because it could keep kids from getting sick or dying. Summer fever is spreading and this could help stop it. So this is the study I would fund. The trade-off of my decision is that researchers who wrote better designed studies will not get any money. Also, people with burns, people who are overweight, and pregnant women who don’t want to feel sick will not get any help. A second-grader comes up to you and says, "We just learned that the sun made all the stuff in my lunch. But my lunch was a tuna sandwich." Using language a second-grader would understand, explain how the sun was the original source of the energy in the tuna sandwich.